Ride for Emily’s Plea | Whats Happening? ← Night of Destruction this Saturday at Bowman Gray Stadium! Join Americas Guardians Chapter NC12A in supporting Emily’s Plea! 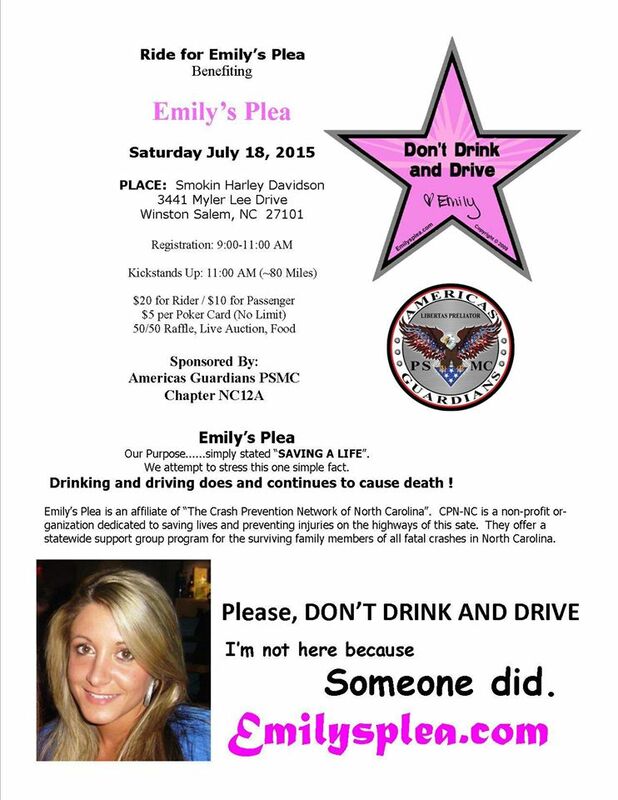 Emily’s Plea is an affiliate of “The Crash Prevention Network of North Carolina”. CPN-NC is a non-profit organization dedicated to saving lives and preventing injuries on the highways of this sate. They offer a statewide support group program for the surviving family members of all fatal crashes in North Carolina. Emily’s Plea was founded in 2009 by Chuck and Becky Kennedy the parents of Emily May. Emily was killed by the senseless act of a drunk driver in May 2007 at the young age of 24. Our Purpose……simply stated “SAVING A LIFE”.Becky and Chuck attempt to stress this one simple fact. We lose hundreds of innocent people each year due to the careless acts of individuals that simply choose to drink and drive. We conduct speaking and educational events at local High Schools; Governmental and Law enforcement agencies as well as support and sponsor events to reduce Drunk Driving. With your help and support we will reduce the number of Alcohol Related Deaths! Emily’s Plea is an affiliate of “The Crash Prevention Network of North Carolina”. CPN-NC is a non-profit organization dedicated to saving lives and preventing injuries on the highways of this state. They offer a statewide support group program for the surviving family members of all fatal crashes in North Carolina. Becky is a regular speaker for the Crash Prevention Network.